First in a series of articles by David looking at Creativity. 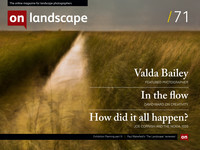 Welcome to Issue 71 of OnLandscape from a wild and wet North West of Scotland. A hectic but brilliant couple of weeks spent in the company of some great photographers in Iceland and latterly in Scotland - although I could have done without the 11hr drive to get here comes to an end this week with some down time to catch my breath. It really re-invigorates your creative juices spending time with such talented photographers. Thank you to all of you who stopped by to see Dave and Andrew at the Photography Show, it was busy busy busy so apologies if they didn't get a lot of time to spend talking with you. In this issue we have the first in a series of articles from David Ward following on from his webinar. We feature Valda Bailey whose personal approach to In Camera Movement and Multiple Exposure photography is refreshingly different and worth more than a cursory look. We have her to thank for our cover image this issue. 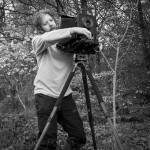 We have an article from Joe Cornish as you have never seen him before - behind a smart phone ! Lastly we have the final article from me on the preparation and delivery of my exhibition at the Ryedale Centre.